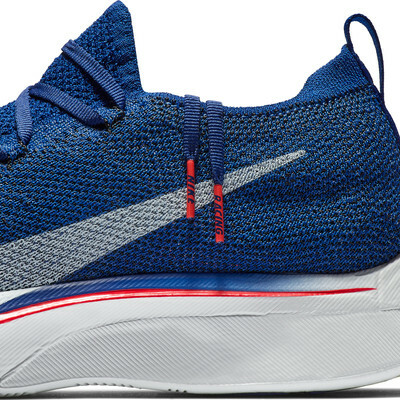 Built to the exact needs of world-class marathoners, the Nike VaporFly 4% Flyknit Running Shoe is built for record-breaking speed. Its Flyknit upper delivers breathable support, while the responsive foam and full-length carbon fibre plate deliver incredible energy return. 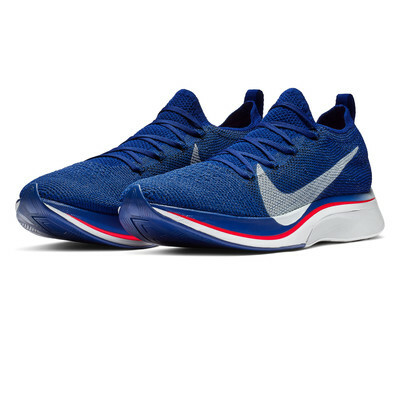 "One 10k and a new PB - what else to say"
Flyknit uppers will encase each foot in breathable comfort. Perforations across the forefoot and tongue increase airflow to create a better, healthier environment for your feet to thrive in. The one-piece construction seamlessly integrates these areas of high breathability with stretch and support where you need it the most, adapting to the changing shape of your foot as it moves through the gait cycle and reducing slippage so that you can enjoy smooth, distraction-free speed. An internal heel counter helps to secure the rearfoot, anchoring you to the midsole and further enhancing the non-slip fitting environment of the Vaporfly 4% Flyknit. Newly designed ZoomX resides underfoot. Ultra-light and super-responsive, the midsole material delivers Nike's greatest energy return yet; it absorbs impact and then expels it back out for a bounce-like effect. This energy-return technology reduces the use of superfluous muscle power, diminishing fatigue and enhancing performance, keeping you going for longer. The revolutionary ZoomX foam is manufactured from Pebax, a product conventionally used in plastic bridges and other moulded parts, and yields cushioning that is not only lightweight, but soft AND springy. Until now, these three characteristics (collectively) have proven nearly impossible to achieve. Pebax has a lower density than some thermoplastic alternatives and this makes it lighter, flexible and more impact-resistant, whilst giving it a higher capacity for energy-return. When blown into a foam these properties remain, gifting you with a lively underfoot feeling that encourages you to run fast. 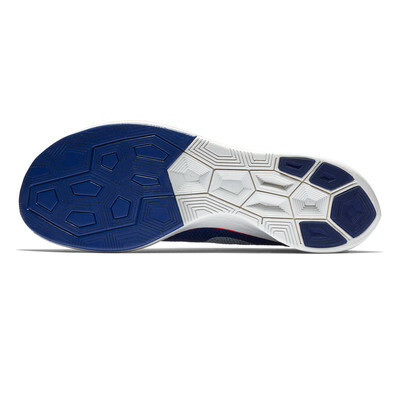 Signalling the incredible resilience of ZoomX, the tiny creases that occur on every midsole do not have an impact on the foam's performance; these beauty marks are a result of the autoclave process which places the foam under extreme heat and pressure. The ZoomX sheets are then compressed in a Phylon preform which shapes the midsole parts. 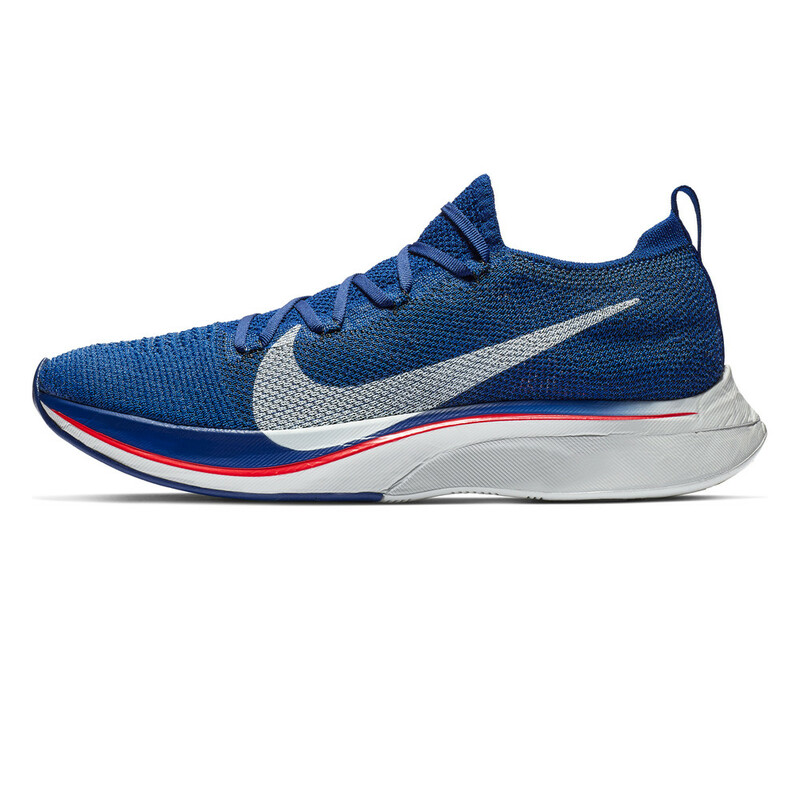 Because the special foam is so lightweight (one third the weight of Cushlon), Nike are able to use more of it to separate your foot from the road; this means you get a thick and supportive midsole that will spare your joints as you strike down onto hard, unforgiving concrete. A distinctive, aerodynamic heel is designed to delay air separation and reduce drag, tapering to banish every barrier between you and your top speed. Embedded within the generous ZoomX platform, and complimenting its responsive nature, is a full-length carbon fibre plate. Intended to minimise energy loss during toe bend without increasing demand on the calf, it springs up under your heel as you stride forward, yielding the snappy, propulsive sensation that converts into extra-energised strides. The plate is curved at the front, helping give the runner back some of the energy they put in at toe-off. 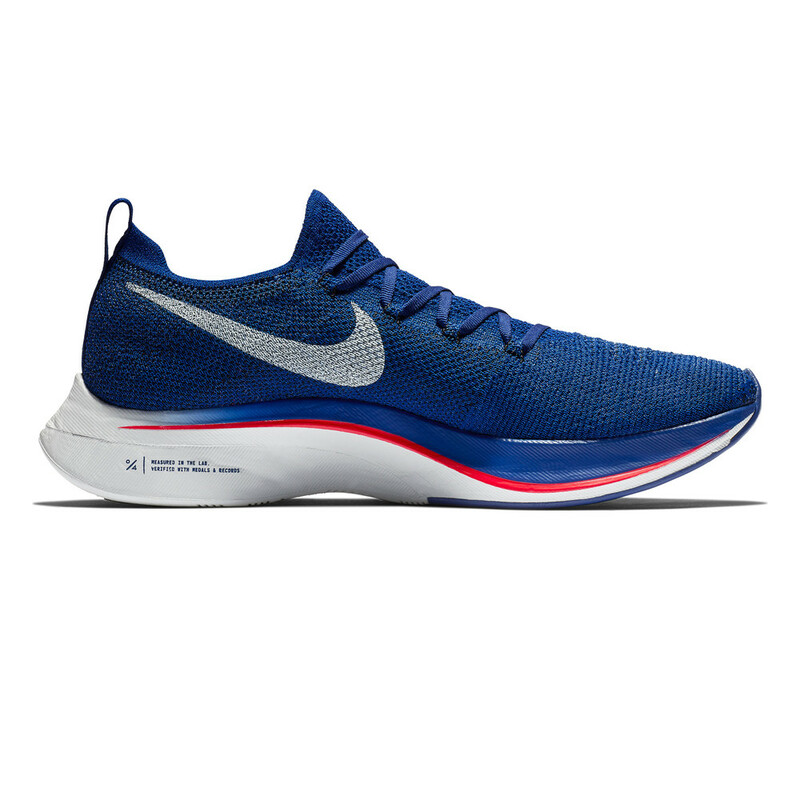 It's this fusion of two contrasting technologies (the ZoomX foam and the carbon plate) that results in the dynamic, power-infused Vaporfly 4% Flyknit, one of the most efficient marathon shoes that Nike has ever sold. A lightweight, but durable, outsole completes the shoe. Its traction pattern is informed by an algorithm to identify lug shapes and sizes that optimise propulsion. The design places optimal rubber on the road for efficiency and traction; high-abrasion rubber adorns the rearfoot to increase durability, resisting the traumas of heel-strike to supply you with a reliable and long-lasting running buddy. Lightweight foam rubber covers the forefoot to provide grip and durability whilst enhancing energy-return. The ten-millimetre drop helps to minimise strain on the calf and Achilles. It's all for the athletes who crave a shoe that's hard to run slow in, a shoe that allows you to maintain any given pace while using 4% less energy, a shoe that delivers world-class performance. Let it be love at first run, choose the Vaporfly 4% Flyknit. One-Piece Construction - Reduces layers and bulk to produce a streamlined fit. 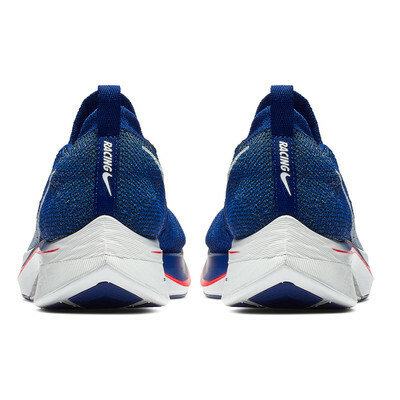 Perforations Across Forefoot and Tongue - Increase airflow to keep feet cool and comfy. Internal Heel Counter - Secures the rearfoot to reduce in-shoe slippage. ZoomX Midsole - Manufactured from Pebax, it's Nike's lightest, most responsive foam yet; it helps to decrease energy loss and increase stamina. Aerodynamic Heel - Tapers to reduce drag, enabling you to go faster. Full-Length Curved Carbon Fibre Plate - Creates a stiff platform of propulsion. 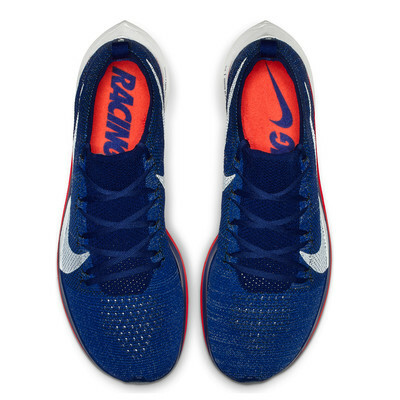 Algorithm Informed Traction Pattern - Uses different lug shapes and sizes to optimise propulsion. High-Abrasion Heel - Increases traction and durability in this high-wear area. Foam Rubber Forefoot - Provides optimal traction, durability and energy-return. Weight - 198g (size 9).